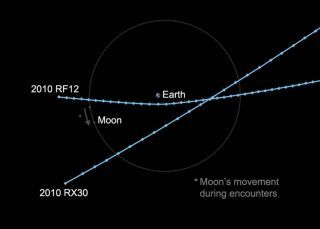 Two small asteroids in unrelated orbits will pass within the moon's distance of Earth on Wednesday, Sept. 8, 2010. Both should be observable with moderate-sized amateur telescopes. Twoasteroids swooping past Earth Wednesday may have caught the attention of thepublic, but events like these are not actually rare, NASA scientists say. "Thisis the first time we've seen [two] combined within a 24-hour period, but that's probably because wedon't know everything that is out there," said Lindley Johnson, programexecutive of the Near-Earth Object program at NASA headquarters in Washington. Single asteroids have been known to make such closepasses, but they usually slip by unnoticed, Johnson told SPACE.com. In fact, witha rough estimate of 50 million unknown asteroids, a 33-foot-wide (10-meter) near-Earthobject could pass harmlessly between Earth and the orbit of the moon every day,Johnson added. Such an asteroid might hit Earth's atmosphere once every 10years, but because of its small size, it would pose no substantial threat to thepeople or property below. "Theywould certainly break up in Earth's atmosphere, or we might get some meteoriteson the ground," Johnson said. In Wednesday'sdouble flyby, the larger of the two space rocks, asteroid 2010 RX30, ?approachedEarth at 5:51 a.m. EDT (0951 GMT), passing within 154,000 miles (248,000 km).It was estimated to be between 33 and 65 feet (10 and 20 meters) wide. The secondasteroid was due to come closer. The 20- to 46-foot-wide (6 to 14 meters) asteroid2010 RF12 was due to pass within 49,000 miles (79,000 km) of Earth at 5:12 pmEDT (2112 GMT), NASA asteroid trackers said. Both asteroids flew well inside the orbit of the moon. Preliminaryobservations suggested both rocks and their orbits are fairly standard. "They'repretty common from what we see," Johnson said. "RF12 is in a very Earth-likeorbit. If it was larger and worth going to, it might be a candidate for aspaceflight mission in the future, but at 10 meters in size, it's not veryinteresting." Astronomersare still unsure where the asteroids originated, but they are hoping thatobservations taken during the flybys will shed some light. "We canproject their orbits back to see what part of the solar system they came from,and hopefully we'll get some information and be able to relate them to asteroidfamilies," Johnson said. Because thetwo asteroids ? discovered only three days before their flyby ? were movingquickly, finding and tracking them across the sky posed a challenge for seasoned skywatchers. Viewers using a 20-inch (50-cm) telescope should have been able to catch a glimpse, Johnson said. Asteroid 2010 RF12 wasparticularly well-positioned for observers in Europe and Africa, he said ? ? "afairly rapidly moving object across the stellar background, (looking) very muchlike a satellite that you see crossing through the star field, though not quitethat fast." Using anetwork of telescopes on the ground and in space, NASA experts and otherastronomers routinely track asteroids and comets that may fly uncomfortablynear the Earth. The spaceagency's Near-Earth Object Observations program is responsible for finding potentially dangerous asteroids and studying their orbits to determine if they pose a risk of hitting the Earth.